It was brought to our sad sad attention that an Etsy (of course!) seller has been blatantly copying our Superior Servers......down to the T....copying our product, process, verbiage, AND even the way the products are styled in the photos!! I know they exist everywhere and anywhere...but this is beyond just "oh it's inspired by or it just looks similar" type of scenario. These people have consciously copied EVERY part of our products and details. As Tiny Fay, Amy Poehler and Seth Meyers would be happy to back me up and say...."Really? REALLY!?!" Tina: REALLY?...Did you actually make a check list of all the things that were in L&G's photos and went down the grocery store aisles going...."ok...let's see here....I need... 7 cherry tomatoes cut in half while leaving on on the table, check. Couple sprig of rosemary, check. Round plate to place on the upper right corner, check. Some fresh parsley leaves on table, check. Whole Roasted chicken with the part of it sliced, check"....and then did you print L&G's image in real size to lay everything out on top so its almost identical even in how the things were arranged? COME ON! This is like when kids use tracing paper to copy cartoon characters before they learned that not all mice HAVE to look like Mickey Mouse!! REALLY. Seth: And COME ON!....did you EVEN TRY to spend some time to AT LEAST think of doing something different or did you think about it for less than a second and then went"....oh, never mind, that's too much work...I should simply do EXACTLY what they did, because why would I want to spend/waste more time to do something different OR unique OR have to use any of my creativity when I can be MAKING MONEY from another person's idea!"....REALLY!?! Amy: and REALLY...were you absent to class everyday in school when they taught that PLAGIARISM is inexcusable AND unacceptable and that you automatically get a big FATF on your grades?! Well....guess what? That rule STILL applies even if you're an adult... you'll still get a big FAT F...U know what. 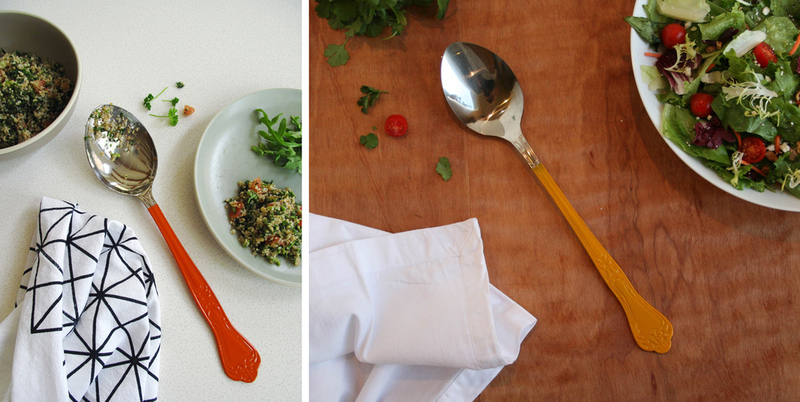 L&G's PRODUCT TEXT: A versatile set of serving utensils with colorful dipped handles. The trio consisting of a stainless steel spoon, carving fork, and perforated spoon is ideal for serving baked dishes, salads, roasts and more. The festive colors make them perfect accessories for weddings, holiday parties, dinner parties, and more. Mix and match your favorite colors separately or pick the versatile 4 piece gift set. Each is piece is constructed of solid stainless steel with a durable food safe dipped handle. CAVALCADE ETSY COPYCAT'S TEXT: This set is ideal for serving baked dishes, salads, roasts and more. The festive colors make them perfect for weddings, holiday parties, dinner parties, and more. Pick your favorite colors to make a one of kind gift. Each is piece is constructed of solid stainless steel with a durable food and dishwasher safe colored handle.